My mother was a cartographer so it was not too much of a leap for my illustrative curiosities to lend towards map making. My maps tell stories and create celebratory connection to landscapes, towns, events, and cause based campaigns. 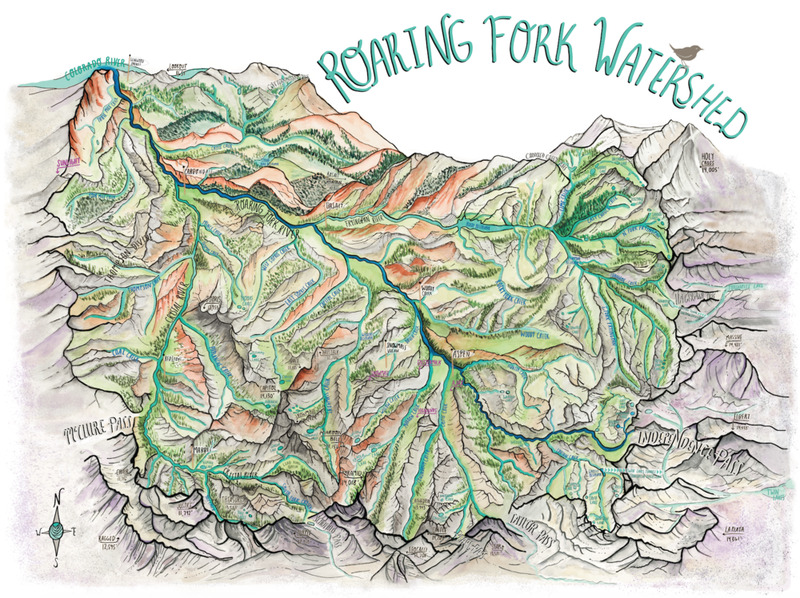 Roaring Fork Watershed Storymap. Commissioned by the Roaring Fork Conservancy August 2018, an organization that works hard to protect our watershed by keeping water in local streams, monitoring water quality, and preserving riparian habitat to ensure healthy rivers in the Roaring Fork Valley. Copies of this map are available for purchase in my shop. Your purchase includes a $25 donation to RFC which will go directly towards local river research, education and conservation efforts! My friend Jen asked me to create a map of the world so her family could follow along with a sailing and photography journey in 2017. 2018 Impact Map for CORE- Community Office for Resource Efficiency. The map was used as the centerpiece to their printed Annual Report- showcasing milestones and productivity up and down the Roaring Fork Valley. Aspen Ski Co commissioned two maps of the ski resort and the town when they hosted the 2017 World Cup Finals. Outdoor Research comissioned this map of the US for their trade show booth display in 2016. They will be using the print on a few new products in 2019. The American Alpine Club commissioned a map of the US for their annual membership report, showing off the top areas to climb in our country. Wedding invite- venue information map!